With the historic Clare Patriotic and Benevolent Association of New York due to parade on 5th Avenue this Saturday, one of their famed banners which will no doubt be proudly unfurled once more brings to mind the value still held by the exiles in one of their greatest countrymen, Brian Boru. This beautiful location set off the idyllic Lough Derg on the river Shannon has inspired great Irish cultural champions in the past such as Edward MacLysaght, and continues to do so today with leading heritage practitioners such as Ruth Minogue of Minogue Associates, Tomas MacConmara, founder of Cuimhneamh an Chláir who has just recently arrived back on Bannerside from a venture in the coiscéim of Lawrence of Arabia in defense of the undefended, the Mayor of Clare Pat Hayes, and the historian and tour operator Ger Madden all developing and promoting the historic gems of this region. Here Daniel McCarthy looks at the legacy of Boraimhe to the Irish people as Ireland approaches the millennium of one of its most defining triumphs, Clontarf 1014. In 941 AD Cinnéide, king of the small but ambitious North Munster dynasty of Dál Cáis, and his wife, Bé Bhionn, a princess of Connaught, and said to have been a most beautiful vixen, had a third son, Brian, born unto them. He became known to history as Boru, or Boraimhe, Brian of the Tributes. Originally known as In Déis Tuaiscairt, the Dalcassians gained a foothold in Clare around 600A.D. With the arrival of the Danes at its territory of Inis Ibthonn or King’s Island in Limerick and the roaming of Viking armies between the plains of Limerick and Ennis, it was the Uí Toirdealbhaigh of the mountainous ranges reaching from Cratloe to the Shannon that grew in power. Their chief, Lorcán, grandfather of Brian was the first of his line to become King of the Dalcassians. He immediately took the war to the Vikings of Limerick. It was upon the death of his successor from the Uí Aengusa, the Abbot of Tuaim Gréine that the term ‘King of Dál Cais’ is used. This is significant because the change of name to `Seed of Cas’, showed growing ambition. Associating themselves with the Royal lineage of Cormac Cas, supposed son of Oilioll Olum and brother of Eógan Mór, ancestor of the Eóganacht and the McCarthys, traditional Rulers of Munster, the Dál Cais were staking a claim to Cashel, seat of the Munster kings. Brian’s own great grandfather hailed from this McCarthy line. The geographic location of Tuamgraney, or Tuaim Gréine, has bequeathed to it a rich ecclesiastical and historical legacy. Nestled away in a stunningly panoramic part of Clare, it was in Brian’s era a major religious center of learning. The ancient annals record that Brian returned to Tuamgraney in 1012 to worship and repair the cloigteach (bell tower) of the monastery. Entering this church which houses the East Clare Heritage Centre today, one follows in the footsteps of Ireland’s greatest King through the only preserved building which has a recorded historical association with him. The area abounds with remains of the past such as the O’Grady Castle which was built to command the nearby ford. It also has the Cathsaoireach, or famine memorial park recently preserved by East Clare Heritage, and the Calvary of East Clare, which was built to commemorate those who fell in the fight for Irish independence. This is located close by the tomb of Grían or Gráinne, a tumulus which dates back to antiquity and from which it is suggested Tuamgraney received its name. Indeed ‘Gráinne’ is the name given locally to the recent find of a sandstone head believed to be a female. Gráinne was revealed as part of the exterior wall structure of this building which is the oldest church continuously used in Ireland, England, Scotland and Wales. This intriguing discovery which also clearly reveals what is often referred to as an ‘evil eye’ continues to generate much interest as to its prominence here, and its symbolization of the enigmatic role of women within the church throughout the ages. It was another female figure of legend that would have fired the imagination of the young Brian Boraimhe. Aoibheal, `the Lovely One’ was the banshee of the Dál Cais, Brian’s tribal family. Her mythical habitation was on the northern slope of Crag Liath, overlooking the great earthen Dalcassian ring fort of Béal Boru just outside Killaloe towards Tuamgraney. In Brian Merriman’s famous poem Cúirt an Mhean Oíche, it is Aoibheal, Queen of the Fairies of Thomond who presides at the assembled Midnight Court in Feakle. Her thrice repeated keen from the great projecting rock at Crag Liath mourned the death of a Dalcassian. Death was always close at hand in the turbulent Irish world, racked by Viking wars and internecine strife, which Brian was born into. It was Brian’s father Cinnéide who was the first king of Dál Cais to lead an army against a major Kingdom, in this case Connaught. He had more success however against the Danes of Limerick but it was under his sons Mathgamhain (951-976) and more particularly, Brian (977-1014) that the Dál Cais attained great power. Brian grew up in a turbulent Irish world gripped by Viking raids and Gaelic power struggles which claimed the lives of his father in 951 and his brother, Mathgamhain, in 976. Mathgamhain, with the close support of Brian, had emerged as the King of Munster, being inaugurated at Cashel in 970. Brian succeeded to the Kingship of Munster in 977 having slain Mathgamhain’s assassins. With the Vikings of Limerick, the Uí Fhidgeinte and the powerful Éoganacht now subdued, Brian casted his eyes beyond Munster. He came into conflict with the powerful Maelsechnaill, King of Tara, who desecrated the sacred Dalcassian site of Magh Adhair in 982 so as to mark Brian’s cards. Undeterred, Brian displayed his well-honed military skills with a series of land and naval attacks that ravage Osraige, Connaught, Leinster and Meath. Brian’s naval fleet, or cabhlach mór, was essential to his campaigns and to his rule of Ireland. He led expeditions ‘Idir muir is tír’, by land and sea. His fleet of 300 boats at Loch Ree carried armies large enough to fight in both Meath and Connaught simultaneously. His ships from Dublin, Waterford and Cork exacted tribute along the Welsh coast and from Argyll in Scotland. In 997, Maelsechnaill and Brian made peace and divided Ireland between them. Two years later they crushed the Dublin Norse and Maolmordha at Gleann Mama. Flushed with success at Gleann Máma, Brian arranged strategic political marriages which saw the kings of Leinster and Norse Dublin become Dál Cais vassals. Brian eventually forced Maelsechnaill’s submission in 1002. He became the first Munster King in history to assume the high Kingship of Ireland. Brian spent the next four years subduing the Northern kings and he also bestowed twenty ounces of gold upon the church of Armagh, acknowledging their claim to being the primatial See of Ireland, the foremost Irish church. An entry by his Dalcassian confessor, Maelsuthain, in the Book of Armagh acclaimed Brian as the ‘Imperator Scotorum’, the Emperor of the Gael. With the North quiescent, Brian embarked upon works of restoration throughout the country that secured his fame. He was fully aware that his influence in ecclesiastical circles has contributed to his success. In his Ireland, Christ and Caesar went hand in hand. Scholarships were awarded, libraries partially re-established, schools and churches were rebuilt following the previous two centuries of destructive Viking raids. He also shrewdly encouraged the commerce that Vikings settlers had built up. He built strong alliances with the Scandinavians, exemplified by the Waterford Vikings who harried Meath on his behalf. The advance during Brian’s lifetime from the rule of Thomond, most of which comprised what is now modern day east Clare, to the rule of the whole of Ireland was a brilliant rise made possible by his military genius, political skills and widespread patronage. Brian continued his shrewd pursuit of dynastic marriages, one of which, the marriage of his daughter to Malcolm II of Scotland is particularly illuminating. Centuries later, every sovereign from the union of the crowns of Scotland and England in 1603 could trace their descent to this marriage. Amongst other descendants today from Brian’s Uí Toirdealbhaigh pedigree are the McMahons (sons of Mathgamhain) Kennedys (sons of Cinnéide) Ó Conaings, Ó Fogartys, Bolands, Duracks, Hanrahans, Larkins, Sheehans, Twomeys, O’Regans, Lonergans, Kellihers, Aherns, McGraths and of course the O’Briens. It was from his beloved Kincora, where stands the Catholic church of Killaloe that Brian reigned as high King, and it was to here that the great chieftains of Ireland came to pay homage and give `hostages’ to Thomond’s greatest. It was during the visit of one such king, Mael Mordha of Leinster who was taken years previously by Dalcassians from a yew tree after the defeat of his Leinstermen at Gleann Máma in 997, that events were put in train that led to its culmination on Good Friday 1014 on the north Dublin fields of Clontarf. Brian’s oldest son, Murchad, from his first marriage to Mór was close to fifty at the Battle of Clontarf. He was a brave and able leader, but lacked the tactful qualities of his father. When entertaining Mael Mordha at Kincora, he insulted the Leinster king, reminding him of the ill judged advice he offered the Norse at Gleann Máma and his ignoble capture from the yew tree there around fifteen years previous. An enraged Mael Mordha, already incited by his sister Gormfhlaith, the scorned wife of Brian, departed Dál Cais bent on revenge. 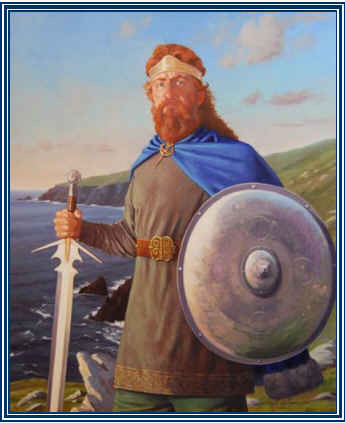 Mael Mordha allied himself with his nephew Sitric, Gormfhlaith’s son, the Norse King of Dublin in a new rebellion, aided by powerful Viking contingents from the Orkneys and the Isle of Man. The seventy three year old addressed his troops, impressing on them that this was a fight for the survival of their religion against the heathens. His army was comprised of his Munster men, less his son Donnchad’s men who had been skirmishing elsewhere in Leinster on the eve of the battle. They were backed up by the two Connaught states now defined by the ecclesiastical boundaries of the Dioceses of Clonfert and Kilmacduagh as well as a contingent of Vikings. Maelsechnaill withdrew his men on the eve of battle, for reasons still unknown. Fierce combat raged throughout the day until the Norse and Leinster lines finally broke and they were set upon unmercifully by the Dalcassians. It was nonetheless a pyrrhic victory as three generations of the Dál Cais dynasty were killed. Toirdealbhaigh, Brian’s grandson was found in a river bed with his hands entangled in the hair of a dead Viking. Murchad, leader of the Dál Cais army in the field was also slain and his father, the seventy three year old High King of Ireland was felled by the fleeing Viking Brodar. It was a disaster for Ireland and for Dál Cais who never fully recovered from this blow. It was his personal qualities that had carved out the greatness which Brian had attained in life, and this greatness was to die with him in Clontarf. He was described in the Lives of the Irish Saints ‘Blessed Brian Boru, King and Martyr’. The ancient chroniclers described Brian as the ‘over king of the Irish of Ireland and of the foreigners and of the Britons, the Augustus of the whole of north-west Europe’. His feats of war and enlightened leadership have ensconced Brian’s name in all that is forever Ireland.